President Laura Perlowski, is serving as President of the club for the 2017-2918 year. The Rotary Club of Livonia meets on Monday at noon at Laurel Manor. The club has 37 members. In addition to weekly meetings, which feature interesting speakers, the club has both monthly fellowship outings and local service opportunities. In addition to helping organizations financially, the club’s efforts have provided manpower to Forgotten Harvest, the Embrace for Life 5K Run, feeding school children in the summer, Blessings in a Backpack, Early Literacy Volunteers at Rosedale elementary school, and so many more. The club also sponsors an Interact Club at Franklin High School. The Livonia A.M. Rotary Club, originally chartered by the Livonia Rotary Club, sponsors an Interact Club at Churchill High School. Every year Rotary has a new international theme. During this past year it has been “Rotary, “Making a Difference.” The Livonia Rotary club is part of District 6400, extending from Harrow, Ontario, Canada, to Adrian, Michigan. The District Governor, Rick Caron, is from Windsor, ON, and he provided the district theme – to “Boldly Go.” “Fuel Up Livonia” was a new and bold initiative taken on this past summer by the club members, working with the YMCA and Blessings in a Backpack, to support our children in the community. The club has participated and completed many initiatives for the community, including Rotary Park, the Legacy Plaza fountain, the pavilions, the baseball diamonds, and the walking track. The club’s newest initiate which has been 5-plus years in the making and includes a State of Michigan grant to the City of Livonia for building a universal playscape at Rotary Park. The Livonia Rotary Club makes a positive difference in the community. The club continues to support its community. Recipients of the financial awards for the evening were the Schoolcraft College Scholarship Fund, the Madonna University Scholarship Fund, the Livonia Family YMCA, the Methodist Children’s Home Society, Kids Against Hunger, the Larry Nehasil Fund, ELVS – Early Literacy Volunteers at Rosedale Elementary School, Seedlings Braille Books, Blessings in a Backpack, Livonia Rotary Park, the St. Mary 5K Run, and the Livonia City Library. 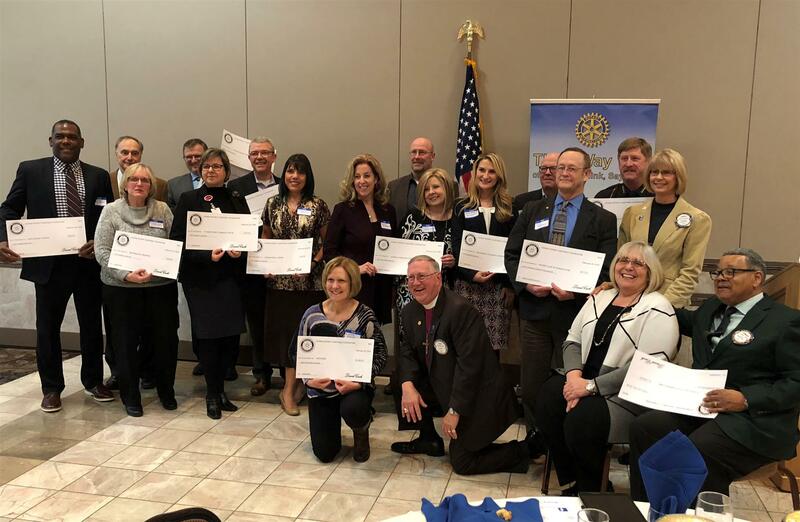 The Livonia Rotary Club also gave financial support to the Rotary International initiatives, among which are planting of trees, eradicating polio from the face of the earth, starting a Learning Center in Tanzania, building a school in Ghana and providing support for many other global initiatives. The presenters for the evening were President Laura Perlowski, President Elect Rev. Dr. David Stechholz, and President Nominee Dr. Janet Haas. Club members were present to participate in this event and to be acknowledged for the hard work that went into each of the club’s fundraisers and activities. The donations were possible due to the fundraising efforts throughout the year, especially the Reverse Raffle. The 2018 Reverse Raffle will be held Monday, April 23rd, at Laurel Manor. The doors open at 4:30 p.m. Please consider purchasing a tax-deductible ticket for $130 – which includes a dinner for 2, 4 drinks, a great dessert, and a chance to win $3000 and other prizes. Many of our top community leaders will be present, and it is a relaxed atmosphere of great fun and fellowship. If you would like to purchase a ticket, please contact Laura Perlowski through the club website www.livoniarotary.org If you are interested in participating in the Livonia Rotary Club to provide service to our Livonia community, please join our lunch meetings on Mondays at Laurel Manor at Noon.